What is an induction hob and how does it work? Although induction hobs look like conventional electric hobs, they work in a completely different way. Electromagnetism creates a magnetic field between the pan and a copper coil magnet below the glass surface of the hob. Electricity passes through the coil to the pan which creates electromagnetic energy which in turn releases heat. It’s clever stuff and means that only the pan gets hot, rather than the surface of the hob. There are other benefits to choosing an induction hob over a conventional gas or electric hob and they’re listed below. One of the selling points of an induction hob is how they safe they are in comparison to their electric and gas counterparts. The pan is heated electromagnetically meaning that only the pan gets hot whilst the hob surface stays cool reducing the risks of burns. The control dial on many models is removable which means that even if a pan is left on the hob then the dial can be removed to prevent accidental switch on, although this is extremely unlikely to happen anyway. The hob is immediately responsive to the dials so if a pan is about to bubble over, you can easily and quickly stop it. An induction hob generates heat directly in the pan, so it heats up significantly quicker than conventional gas and electric hobs. Therefore, your food cooks faster and you save time, energy and money. Since the hob only heats the pan where it is in contact, less heat escapes compared to gas and conventional electric hobs. When less heat is wasted, less energy is used, which brings down your bills and environmental impact. Your kitchen will also remain cooler whilst you’re cooking which could help reduce steam and mildew. Since the hob surface rarely gets hot, food won’t burn onto it, making cleaning a breeze. You’ll be able to wipe away spills rather than spending half your night scrubbing at burnt on Bolognese. Induction hobs seamlessly integrate into the work surface, creating a sleek and stylish look in your kitchen. Induction hobs are extremely responsive with many settings and more temperature increments, allowing for precise control of heat. The hob also performs better at low heat settings, allowing you to keep food warm easier. It’s true that induction hobs are pricier than their gas and electric counterparts, although the cost of them has almost halved in the last 5 years as technology advances, competition increases, and prices get lower. You’re also likely to save money in the long run as your energy consumption and bills decrease. If you’re remodelling your kitchen it makes sense to have an induction hob installed as it offers important benefits which conventional hobs can’t. Prices start around £300 and can go up to £3,000 for top of the ranges models. 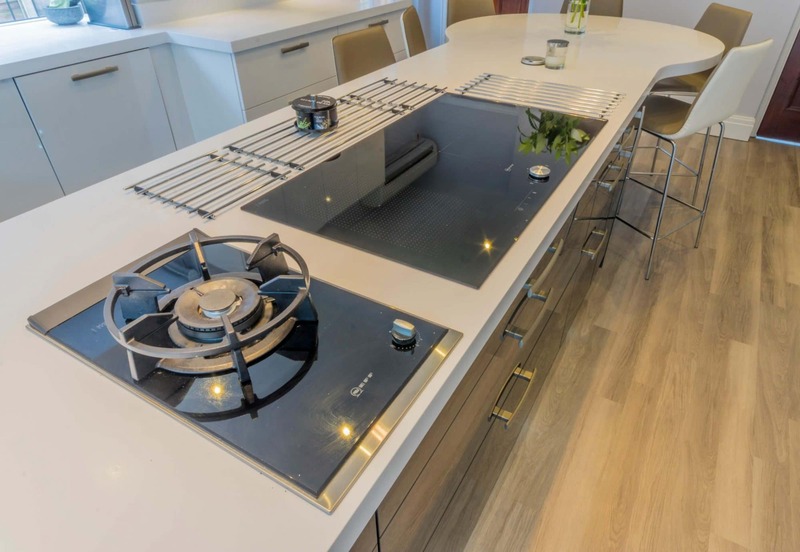 If you’d like to know more about induction hobs or you’re thinking of renovating your kitchen and including one, pop us an email or give us a call and we’ll be happy to help!